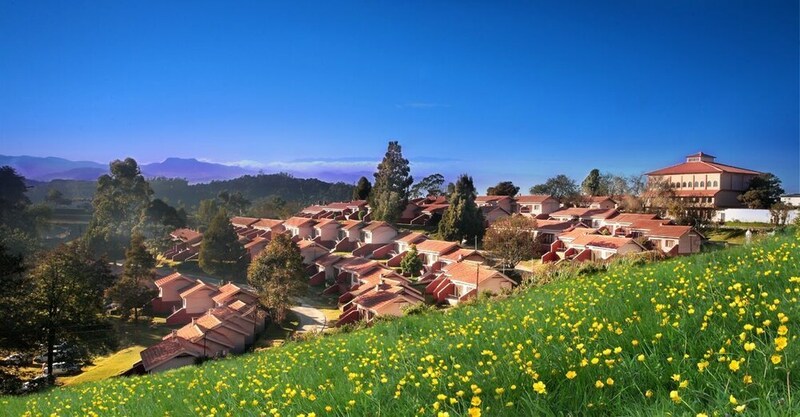 Terraced along a hillside, Hotel Lakeview is a 10-minute walk from Ooty Lake and the boathouse. Central Ooty attractions such as the Botanical Gardens and St. Stephen's Church are within 3 km. Doddabetta Peak is 10 km away. Hotel Lakeview's Supper Club restaurant showcases Indian, vegetarian, Chinese, and Continental cuisine. The concierge desk is happy to help arrange horseback-riding, sightseeing, and eco-excursions. Each self-contained cottage features a deck overlooking the lake and valley, along with a private garden, fireplace, living/dining room, and separate bedroom. Other amenities include TV. Popular for family and couples getaways, this Ooty hotel, built in 1987, offers a quiet setting on a hillside with breathtaking views of the valley, mountains, and lake. Guests are housed in individual cottages arrayed along the terraced slope. Indian, vegetarian, Continental, and Chinese cuisine are served at the Supper Club restaurant. Room service is available early morning till late evening. Picnic areas dot the grounds, and bonfires and barbecues are provided upon request. Children have their own separate playground. Onsite shops sell books, souvenirs, and sundries. Wireless Internet access is provided for a surcharge. A Roundtrip airport shuttle is also available on request and for a surcharge. The Supper Club - This restaurant is known for its vegetarian and Indian cuisine, as well as Chinese and Continental fare. Room service is available from early morning until late evening. A resort fee is included in the total price displayed. Only registered guests are allowed in the guestrooms.